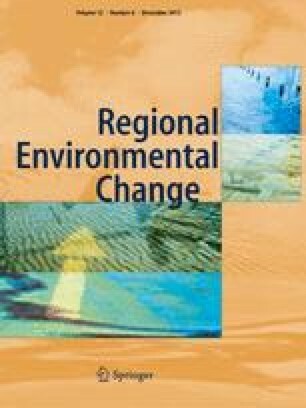 Decision-making for the purpose of adaptation to climate change typically involves multiple stakeholders, regions and sectors as well as multiple objectives related to the use of resources and perceived benefits. Standard cost–benefit analysis can be argued to take into account easily monetised effects only. Multi-criteria decision analysis (MCDA) embedded in participatory processes can therefore play an important role in defining the decision context and exploring stakeholders’ preferences. In this paper, a case study on flood protection of the Kokemäki river running through the city of Pori in West Finland was conducted. The study was realised as a MCDA workshop involving the key stakeholders of the region. The analysis produced a robust ranking of the considered flood protection alternatives. According to the stakeholders, the approach was useful as an exploratory way of gaining a deeper and shared understanding of the flood protection. It was shown that MCDA is well suited for decision-making in adaptation to climate change–enhanced extreme events. This research was carried out as a part of the TOLERATE project, which was financed by Finland’s Climate Change Adaptation Research Programme (ISTO). The authors would like to thank the anonymous reviewers for their valuable comments and suggestions to improve the quality of the paper.